BUY TICKETS FOR THE IRELAND TOUR! BUY TICKETS FOR THE BOSTON SHOWS! Disaster has struck. The unthinkable is happening. Please no, say it isn't so..... JESUS IS GOING HOME. A small Irish village is in turmoil. What will it do without its main revenue stream? You see.......Instead of Bethlehem, Jesus was born in Ireland. Ballygoura, County Galway, to be exact. He cured a few goats of liver fluke in his youth and there was talk of him being able walk across Walsh's bog but nobody ever took him seriously until one day when he turned water into wine. The village had struck gold and dutifully kept this quiet. They persuaded Jesus to quit his job as a carpenter and that his gospel would be best served by supplying every pub in the area with free alcohol to sell. They have just built a new reservoir and final plans are in place for a brewing company that would make Guinness’ look like a lemonade stand. The problem is that God has asked for Jesus to return to heaven. A village's quest to hold on to their most valuable son. Can Ballygoura persuade ‘the almighty’ to let Jesus stay? Maybe there is one last hope…maybe even God has a weakness. 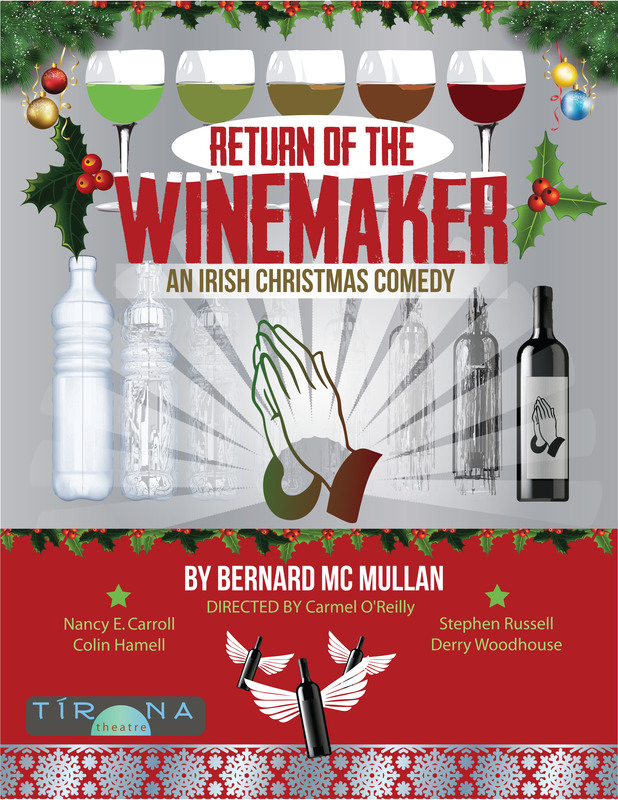 Return of the Winemaker is a dark comedy celebrating Christmas the way only the Irish can. Cork Arts Theatre, Cork Ireland, November 22nd-26th 2016: Buy Tickets Now! The Rockwell, Davis Square in Somerville MA, December 1st-23rd 2016: Buy Tickets Now!